The real estate personal guarantee, also known as a co-signing agreement, that allows the owner of property to make a tenant and/or a third (3rd) party be personally liable for a lease agreement. This means that is a the tenant does not pay rent, damages the property, or incurs any other financial or legal harm that the individual(s) that personally guarantee the lease will be considered liable for the damages. Release of Personal Guarantee – To be executed at the completion of a lease or if the Guarantor is to be released for another reason. 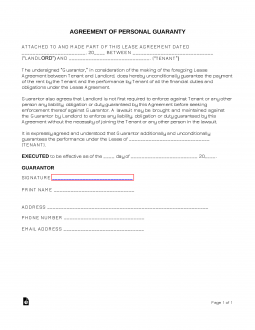 Step 4 – The document is now apart of the lease and the tenant shall be held personally liable in the chance of default.